Aluminum oxide cloth flap wheels with 1/4" straight steel shanks. 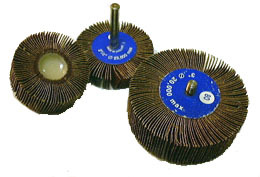 Flap wheels with 1/4-20 threaded shanks available on request. All are packed 10 per box. Contact us for other sizes and grits. Email or call 1-800-367-7291 for your requirements. All wheels in this table have 1/4" unthreaded shanks.